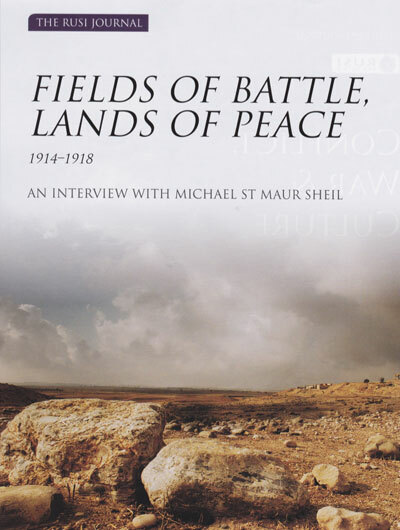 Fields of Battle-Lands of Peace 14-18 is the work of photo-journalist Michael St Maur Sheil. Captured over a period of eight years, Michael’s photography combines a passion for history and landscape and presents a unique reflection on the transformation of the battlefields of the Great War into the landscape of modern Europe. “This collection represents a legacy which I hope will create a gateway to the battlefields themselves, thus encouraging people to visit these historic landscapes during the centennial period and so create awareness and understanding of the events and historical implications of the First World War". After studying Geography at Oxford, in the early 1970's Mike began his life as a photo-journalist by covering 'the Troubles' in Northern Ireland. Here he became associated with the New York picture agency, Black Star and over thirty years later he is still in the fortunate position of being paid to do what he loves doing - taking photographs. Mike has visited over 60 countries around the world, working for a wide range of clients such as ABC-TV, BBC, Anti-Slavery International, British Red Cross, European Commission, National Geographic, New York Times, Shell, Time & Time Life. “No they would not be lonely, I saw that bare country before me...the miles and miles of torn earth ... the litter, the dead trees. But the country would come back to life, the grass would grow again, the wild flowers return, and trees where now there were only splintered skeleton stumps. For me these words, which are both a declaration of loyalty to lost comrades and faith in a future world of peace and tranquillity, give some reason why all these years later we should be thankful to the men of ’14-18. The writer’s nationality does not matter [he was an Englishman, P J Campbell] because his words are those of any soldier looking to a future in the hope that it will make sense of the past. It was whilst on a visit to Dunkirk with my father, who had fought there in WWII, that I first became aware of the close attention that soldiers pay to the ground which surrounds them and the way in which their vision of a battlefield extends not to miles but just the yards,evenfeetwhichtheycansurveywithoutthemselvesbeing seen. 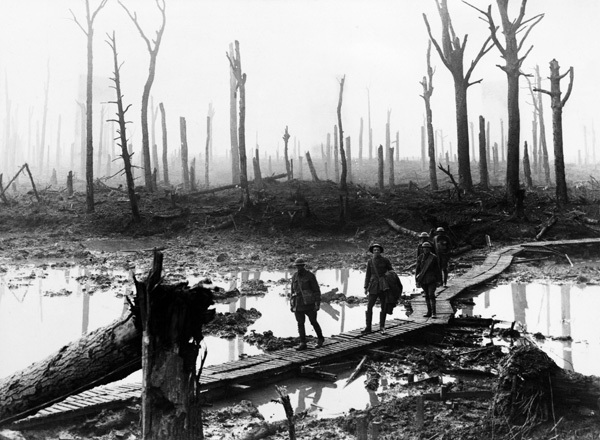 It was Richard Holmes who shaped this further by insisting that my pictures should not just be an emotional response to a battlefield where men had died but should seek to tell the history, the stories of the men who fought there. The support shown for the Fields of Battle Lands of Peace project has been extraordinary. 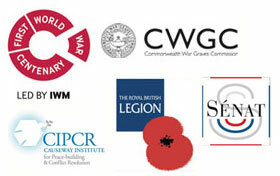 The logos above represent a small number of the diverse organisations involved with the project. Click above to find out more. 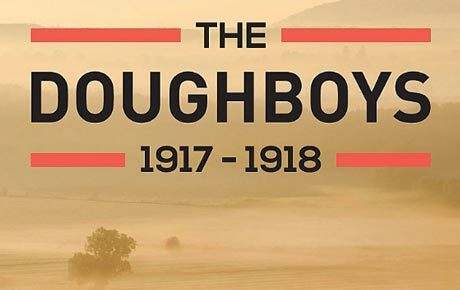 ‘The Doughboys ‘1917-1918’, featuring the part played by America during World War I, commenced simultaneous tours in the U.S.A. and the U.K. - Visit our exhibitions page for tour information. Click HERE or on the images below to visit a gallery of images for sale. Then simply click on the image you want, choose your product and order. Mike St. Maur Sheil will be donating 5% of his profits from the sale of prints to the Fields of Battle 14-18 Charitable Trust. 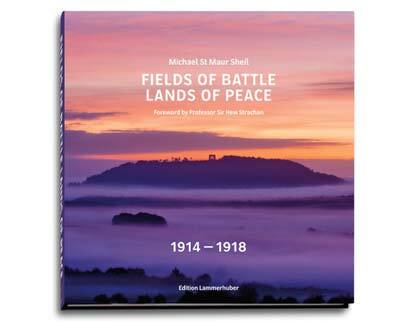 A stunning 264 page, full colour book illustrating Michael St Maur Sheil's journey documenting the battlefields of the First World War is available to buy online from early June 2016. 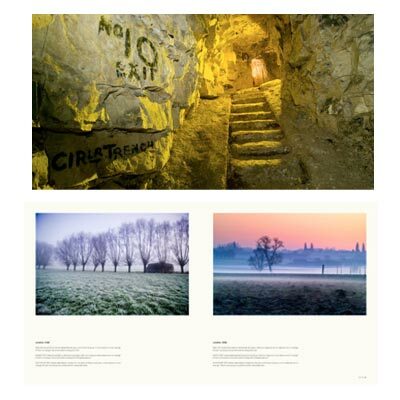 With a foreword by renowned Historian Sir Hew Strachan, this moving series of photographs illustrates the power of nature and time to effect a transformation from the gruesome past and create landscapes whose very shape preserves the memories of The Great War in vistas of peace and tranquility. Click the images to the right to buy your copy securely online. 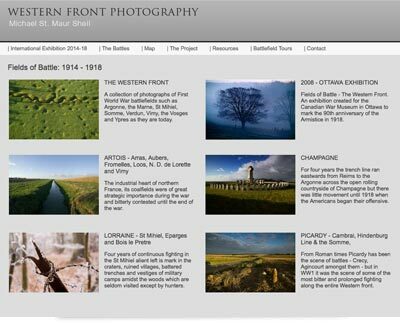 Mike Sheil's website, Western Front Photography, offers a further insight into his work with multiple galleries featuring images from each of the battlefields he has visited over his seven year journey. Click the image to the right to visit the site.